Prosthodontists, as specialists in tooth replacement, understand the appropriate use of each type of tooth replacement. Through a careful patient examination, an understanding of individual patient preferences, and a knowledge of best current research evidence, appropriate tooth replacement decisions for individual patients can be made. Tooth replacement methods are dependent upon whether there are healthy natural teeth remaining in the upper, lower, or both jaws. Edentulism, or complete edentulism, means no remaining natural teeth in the upper, lower, or both jaws. Partial edentulism means some healthy natural teeth remaining in the upper, lower or both jaws. We add “healthy,” because if the remaining teeth are not healthy, the teeth will be planned for removal, and the patient will be making a transition from partial edentulism to complete edentulism. 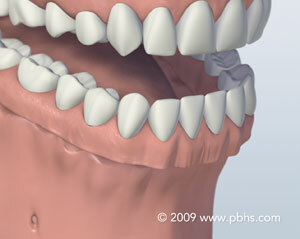 Fixed bridges and removable partial dentures are treatment for partial edentulism. They depend upon healthy natural teeth. Dentures (also called complete dentures) are treatment for complete edentulism. They do not depend upon the presence of natural teeth. Dental implants have greatly expanded tooth replacement possibilities. 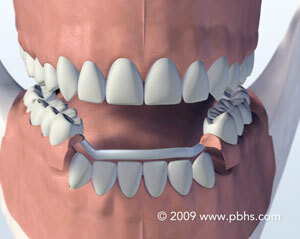 A fixed bridge is a connected set of replacement teeth used for partial edentulism. It is cemented into position over the reshaped teeth adjacent to the empty space. The outer enamel layer of these teeth is reduced to make room for the dental crowns (called retainers) that will cover the teeth adjacent to the space. 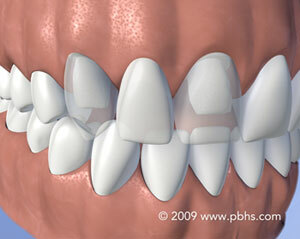 Resin-bonded fixed bridges are an alternative design in which the enamel of the adjacent teeth is not removed. Instead, the replacement tooth has wings that extend to either side, and that are bonded to the back surface of the adjacent teeth (pictured below). This type should not be used for more than one replacement tooth. A removable partial denture is removable at will by the patient, and is also used for partial edentulism. It is a very thin metallic frame that fits the teeth and gums intimately, to which acrylic replacement teeth are bonded. Wire clasps are part of the frame, and keep the partial denture in place. A removable partial denture is designed according to the pattern of tooth loss, and incorporates sophisticated engineering principles. The traditional solution for complete edentulism is complete dentures. Some people adapt well to dentures. Others have a more difficult time, especially with lower dentures. Today, dentures can be stabilized, or avoided entirely, by utilizing dental implants. Dental implants are described in the next section. They have various applications to both edentulism and partial edentulism. They can be used to replace individual teeth, support either end of a fixed bridge, or help secure specialized dentures. Implants often last a lifetime, but some care and maintenance is required. How have dental implants expanded tooth replacement options beyond traditional methods? Dental implants may be used instead of natural teeth to support fixed bridges, and may also be used to assist in the retention of removable partial dentures. 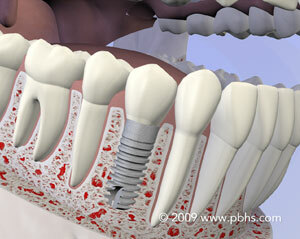 In addition, dental implants can anchor and stabilize complete dentures.